from an Old Reliable Company! Attention: Meyer Manufacturing will no longer will be manufacturing the Woodchuck Wood/Coal furnace due to EPA regulations. We will continue to supply parts and assist over the phone as needed. Specifications and manuals are available on this website for your assistance. 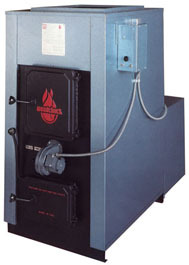 The Woodchuck Add-on furnace line can eliminate the unpleasantries of in-home woodburning. The Woodchuck is usually placed next to your present Central Heating unit instead of the main living area of your home. This means NO firewood, dirt, or bark to clean up, or hot surfaces to guard from small children. Woodchuck offers the comfort of luxurious, even heat distributed throughout your home. The cost of oil and gas DOES NOT mean you must abandon or replace the central heating system designed for your home. After all, it's the oil and gas consumption we want to reduce, not the system. Cold Air Return Filter Box--Provides a means of keeping any foreign materials or objects from getting into the blower housing and damaging it. It also provides a convenient manner in which to filter the system air as well as connecting a cold air return duct which is a MUST in any good installation. Shaker Grates--On the Model 2900/4000, shaker grates are a standard feature, a must when burning coal. The 2900/4000 is designed with an outside handle for shaking ashes without having to open the ash door. 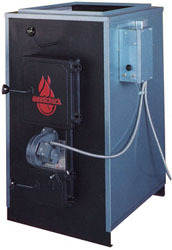 Blowers--All Woodchuck furnaces come with a large blower and motor as standard equipment. The three speed motor allows for gentle circulation of the air when heating requirements are low and high output when heating requirements are high. By using a larger blower, the noise level is minimal during operation. Forced Draft--The 60 CFM draft blower is controlled by the thermostat in your house (thermostat supplied with kit). Advantages of the forced draft are quicker recovery and greater turbulence inside the firebox for better mixing of fuel and oxygen. 80/20 Combustion Air Selector--Extensive research conducted by various laboratories around the country show that as wood burns, 80% of it burns in the gaseous state while 20% burns as fixed carbon in the solid state. Coal burns just the opposite of wood, that is 80% burns as fixed carbon and 20% burns in the gaseous state. The studies also show that combustion air should be preheated before entering the firebox. 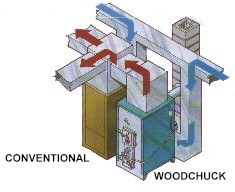 Only Woodchuck furnaces provide a mechanism that not only preheats the combustion air but also allows the operator to choose the proper setting depending on the type or amount of fuel used. Heavy Duty Cast Iron Doors and Safety Latches--Both the loading and ash door are made of high quality, heavy cast iron to resist cracking or warping due to high temperatures. This insures an airtight seal and safety. The doors are equipped with positive latches and the loading door has a two stage safety latch. The Smart Box--This is the "brain" of the Woodchuck furnace. Fan limit turns the main blower on and off automatically. Can manually adjust the three speed blower to the system air temperature thereby providing the PROPER amount of blower capacity--not too much or too little. Allow the thermostat to turn the draft inducer on and off, thereby maintaining the proper heat output for your needs at any particular time. Overrides the thermostat and stops the draft inducer if the unit gets too hot. Overrides the thermostat and stops the draft inducer if the unit runs out of fuel. Allows a second thermostat to turn on the electric element and blower to heat your house if the unit runs out of solid fuel. Secondary Heat Exchanger--The Model 2900/4000 is equipped with a secondary heat exchanger that is separated from the firebox. This feature greatly enhances the transfer efficiency of the unit. Double Back--The Model 2900/4000 firebox back is set back approximately 2". This allows the blower to circulate air over more firebox area increasing the transfer efficiency of the unit. Model 4000 also also has double front. 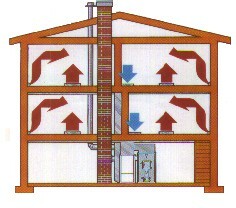 cost efficient answer to your high home heating costs. satisfied and warm Woodchuck owners. 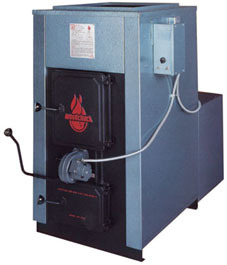 Domestic Coil--In addition to heating, the Woodchuck line of furnaces can provide the hot water for your domestic use. The forced air unit can be equipped with a coil that fits right inside the firebox. Catalytic Combustors--The Models 2900, 4000 and some older models will accept a catalytic combustor. The combustors are easily installed and removed and help insure that the small amount of unburned material is destroyed before it leaves the unit. This further increases combustion efficiency and decreases emissions while reducing the accumulation of creosote and the hazard of a chimney fire. Weight 445 lbs. 700 lbs. 815 lbs. Gauge of Firebox Steel 10 ga. 7 ga. 4 ga.
(Newer Home) 1600 sq. ft. 2600 sq. ft. 3600 sq. ft.
Fire Chamber Capacity 6.1 cu. ft. 7.7 cu. ft 9.1 cu. ft.
Log Length 22" 22" 24"
Coal Capacity 140 lbs. 180 lbs. 230 lbs. Loading Door Size 14" x 12" 15" x 13" 15" x 13"
Ash Door Size 6" x 8" 8" x 11" 8" x 11"
Flue Size 6" 8" 8"
Flue Collar Heigh 41" 47" 50"
Plenum Outlet Size 20" x 23" 20" x 23" 20" x 23"
Woodchuck design continues to set the standard for clean burning, trouble-free operation. The level of quality and durability build into all Woodchuck products is assured by the warranty printed in every owners manual. A complete line of models and a full range of options means you purchase only that which your particular central heating system requires. Sizing a furnace is very important and Woodchuck suggests you consult a qualified installer or heating specialist. Manufactured by Meyer Manufacturing Corporation.